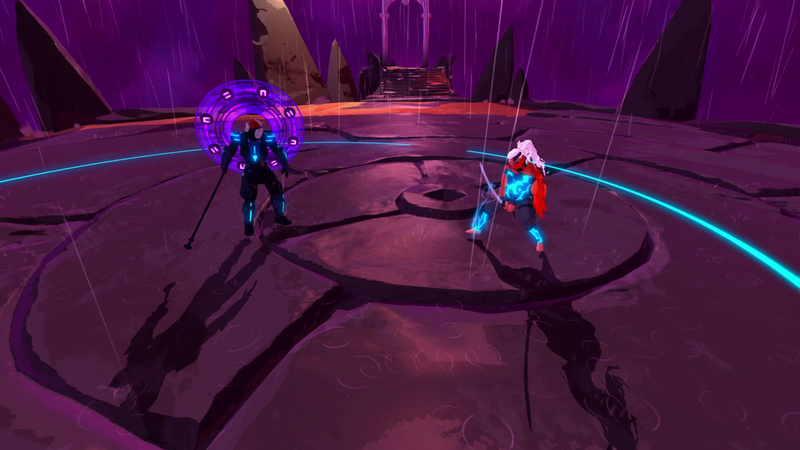 We finally announce Furi, the game we’ve been working on for a while now and our creative take on Beat’em up / Hack and slash games. Check the first trailer! 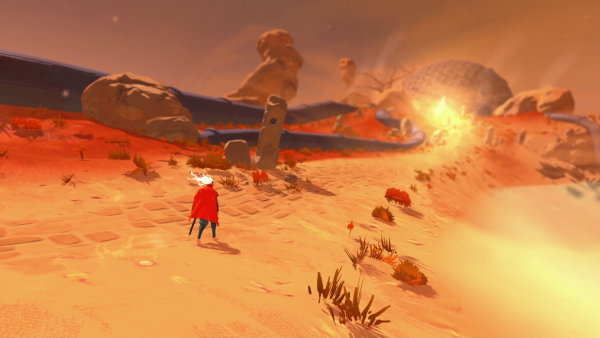 Emeric Thoa, the game ‘s Creative Director is sharing more about the back story of Furi. « The story of Furi starts ten years ago, on a plane, as I was headed to a game show. At the time I was a junior designer for a big videogame company (guess which one :P). Indie development hadn’t really taken off yet, so the idea of making my own console game was nothing more than a pipe dream. But the person travelling with me (my boss!) asked me what I would do if I could make my dream game, and I told him about this game that would be one long boss fight. A boss fight against an opponent similar to you, not a gigantic creature or a demon. A boss fight that felt like a duel— a tense, exhausting, and utterly rewarding duel. Furi is the manifestation of this idea that’s stuck with me for the past ten years, as I grew as a designer and then set up The Game Bakers. Furi is a game where you fight for a reason. It’s a game that teases you before the fight, while you walk toward your fate, the same way you would be pumped up and stressed before a boxing match. As you do, you’ll start to piece together about why you’re here and what you’re fighting for. And then there are the duels. Furi’s combat gameplay is designed with Japanese games in mind—ultra fast-paced and responsive. Your character moves as soon as you send an input. Skills and reflexes are required to dodge and parry the enemies’ attacks. You beat your enemies by shooting like in a bullet hell shoot ’em up, and by swordfighting like in a samurai duel. Each boss you face off with has a unique fighting style that you’ll have to figure out how to beat… not to mention a unique look designed by Afro Samurai creator Takashi Okazaki. The soundtrack is something we are really proud of. A handful of super talented electro musicians and bands are composing original creations for the different bosses of the game. Carpenter Brut is one of them, he has composed for the teaser trailer too. We are still hard at work polishing the game, creating the final bosses, and even throwing in an Easter egg or two. Furi is set to release in 2016, but we’ll keep you updated in the meantime. Until then, I hope you enjoy this first trailer! Below the full press releases in English and French. 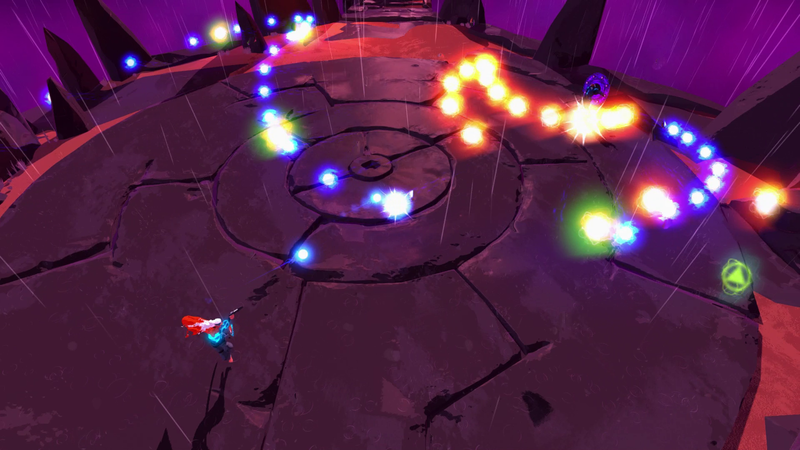 MONTPELLIER, FRANCE – October 14, 2015 – French indie studio The Game Bakers have pulled back the curtain on Furi, their upcoming combat game slated for release on PlayStation 4 and PC in 2016. Furi feeds on the tension of one-on-one fights against deadly adversaries. It’s an intense, ultra-responsive hack-and-slash with a unique mix of fast-paced sword fighting and dual-stick shooting. Each of the formidable guardians—designed by Afro Samurai creator Takashi Okazaki—has a unique and surprising combat style that requires focus and skill to defeat. Defeat one boss after another to escape this surreal prison and discover what’s waiting behind the last gate. The high-energy action gets a boost from an explosive soundtrack composed by up-and-coming electro musicians including Carpenter Brut, who created the trailer’s theme. The Game Bakers will be available for interviews to discuss Furi at Paris Game Week from Tuesday through Thursday, October 27-29. Please email Audrey Leprince audrey@thegamebakers.com to make an appointment! MONTPELLIER, FRANCE – 14 Octobre 2015 – Le studio indépendant français The Game Bakers a levé le rideau sur Furi, leur prochain jeu de combat prévu pour une sortie sur PlayStation 4 et PC en 2016. Furi se nourrit de la tension des combats en face-à-face contre des adversaires formidables. C’est un beat them all intense et hyper réactif avec un mélange unique de combat à l’épée et de shoot dual-stick. Chacun des gardiens – conçus par le créateur d’Afro Samurai Takashi Okazaki – a un style de combat unique et surprenant qui nécessite de la concentration et du skill. Combattez-les, les uns après les autres, pour échapper de cette prison surréaliste et découvrir ce qui se trouve derrière la dernière porte. L’action très nerveuse est boostée par une bande-son de compositions originales de musiciens de la scène electro dont Carpenter Brut, qui a créé la musique du trailer. The Game Bakers sera disponible pour parler de Furi à la Paris Game Week du mardi 27 au jeudi 29 octobre. Envoyez un email à Audrey Leprince : audrey@thegamebakers.com pour prendre rendez-vous ! Sounds intense … can’t wait to try it for myself!